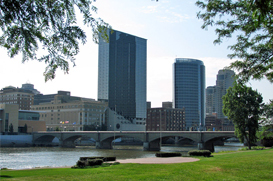 On the Grand River sits the second biggest city in Michigan, Grand Rapids, with a population of 188,400 in the 2010 census. The city is located a convent 40 miles east of Lake Michigan, one of the most popular tourist destinations in the state. When driving into the heart of downtown Grand Rapids from either of the main arteries (131 N&E or 196 E/W) the skyline is an impressive outline of buildings and high-rise condominium surrounded by clean and green environments. The Grand River flows under the many bridges and thru the center of the city. Grand Rapids is a big city with a small town feeling. One can reach any destination within fifteen minutes due to the exceptional highway system. The city has been blessed by the generosity of its’ many philanthropist who have loved the city and continue to contribute to its growth and well-being. The most obvious example of this is what has come to be known as Medical Mile. Medical Mile is located on Michigan St hill and houses medical schools from each of the world known medical universities in the state. It also is the location of world class women, heart and children hospitals. The city is home to the Gerald Ford Presidential Museum dedicated to its’ home grown president, Gerald Ford the 38th that completed President Nixon’s’ term. The museum is also the burial site for President Ford and Mrs. Ford. The Grand Rapids school district is an example of urban development at its’ best, the greatest being its’ “Centers of Innovation” schools. These schools of choice are college focused business curriculum (“theme schools”) from College Prep to Business. Its’ Montessori school is one of the top schools in the U.S. The districts’ school of choices includes all-day preschool and kindergarten, year round and schools that students wear uniforms all of which have been proven to improve student performance.